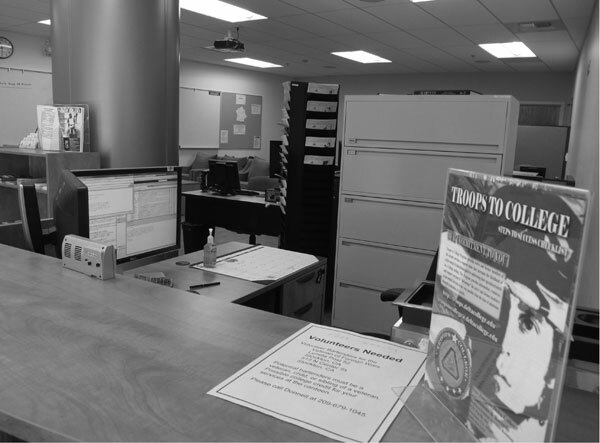 The Veterans Resource Center has a new home in the DeRicco Student Services Center, near the Pacific Avenue entrance to the campus. The new center is located in DeRicco 151. With Delta College housing over 400 veterans on campus it is only logical to have a “central hub” available, according to a pamphlet handout for the center. Features of the center include quiet study areas, tutoring, computer access, Veteran Student Alliance meetings and networking with other veterans on campus. The center hours are from 8 a.m.-5 p.m. Monday through Friday. The main center in Budd 310 will continue to offer limited daily amenities. Assistance is also provided to veterans in DeRicco 151 or through Delta’s VET Hotline at (209) 954-5151 ext. 6158. Support services include the computer loan program, book loan program, GI Bill and FAFSA application assistance, and also help with scholarship submissions. “You’ve stood the watch, now it’s our turn to stand by you while you pursue your career and educational goals,” states the pamphlet touting the center. The Troops to College initiative, set up under the Obama administration, is designed to make veterans aware of educational possibilities and assistance offered for said veterans has ultimately made this possible for our student veterans.